GIGTRICKS: A COMPLETE INTEGRATED ECOSYSTEM FOR FREELANCE AND ON-DEMAND ECONOMY!!! Reports has shown that the freelance and on-demand economy are lacking the principle standards to form a trusting business relationship between clients and freelancers. This problem can be solved through GigTricks as it will be seeking to build a blockchain based ecosystem to increase transparency, trust and reliability among the platform participants: that is, clients and freelancers. Every action, including reviews and skill ratings, will be verified by the platform participants within the immutable blockchain and as such, nothing can be forged within the ecosystem. 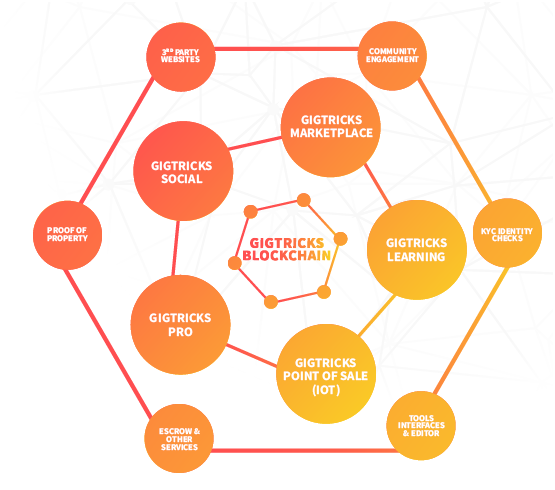 The main objective of GigTricks is to create the world’s first 3600 (degrees) freelance and on demand ecosystem which will be trusted by a community of millions. Ultimately, the GigTricks platform aims to help in the fight against global recession by creating much or extensive opportunities for talented individuals so that they can simply find the gigs, work from home, and generate income so that they can spend on their consumer needs resulting in a true economic growth. WHAT IS GIGTRICKS ALL ABOUT? The GigTricks Limited is a private company that is limited by shares and is incorporated in Gibraltaar in accordance with the Companies Act 2014 and with the registration number 117112. Gibraltar was chosen to be established due to the understanding that its jurisdiction is crypto-friendly. There are people who direct the GigTricks company. The function of these directors is to be responsible for the activities of the company and to oversee the Company’s activities on a day to day basis. The directors shall exercise their powers in accordance with the Company’s articles of association and their fiduciary duties to the Company. They are vested with all the powers to perform all acts that are necessary or useful to manage and control the business of the company and the development of the GigTricks platform. MISSION OF GIGTRICKS: The GigTricks company is seeking to create a completely upgraded version of the current freelancing platforms that will be futuristic in its ability to offer various opportunities, minimize the risks and create a winning scenario for all stakeholders that are involved. GigTricks have a vision in which they plan to become a reality. This vision can become a reality as it creates a viable, accessible and low cost freelance platform that will seek to benefit as many countries as possible!!! The GigTricks ecosystem architecture has been designed to be highly scalable to ensure its flexibility. This simply means that the freelancers will be able to sell/market their products and/or services online or offline as a part of the ecosystem. For example, a digital marketer could develop and also offer a course or sell a product or service on the GigTricks platform either online or offline (that is, in person). The freelancer can then recieve payment via the GigTricks crypto tokens named as the GigBit token (GBTC). The GigTricks platform aims to make global adoption an effortless process. 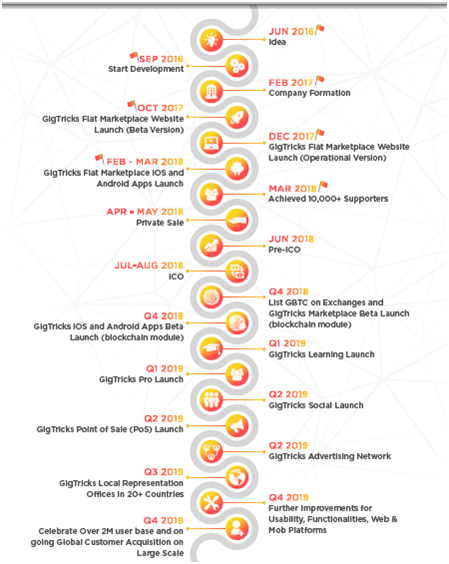 The GIgBit token (GBTC) is based on ER20 format and it works in the Ethereum nettwork because it will make it easily adoptable by the community and by the market. The Ethereum based token is a good solution for regular payments that are above small amounts such as $0.0001. GigTicks will utilize GigBit credits for micropayments to make them more cost-effective. The Gigbit credits are not tradable. They will be issued by the platform and can be converted to GigBit tokens only. The GigBit credits cannot be sent from one user to another, otr outside the platform. This crypto token (GBTC) is intended to enable a means of payment across the ecosystem for its participants globally. The token can be used for: In-app transaction for unlocking products or services, Users subscriptions, Community rewards, Advertising, Royalty payments, and Freelancer tipping. The GigTricks Social platform aims to allow the users to earn GigBit tokens by simply publishing and/or viewing social content. The GigBit tokens can be used as a means of payment for additional skill tests in GigTricks Pro or to access premium services like GigTricks Learning which will seek to enable the user to learn additional skills. The users will be able to view both the freelancers’ overall profile rating, their specific skill ratings and reviews and this decreases the communication time between the clients and freelancers by over 90% percent. Although, if any dispute arises, gigtricks has already implemented an incentivized voting system which increases trust and engagemant. The world wide or global markets are expanding, and business throughout the world are now able to build grow and scale their business in a much faster way!! !